Does a printed guide take up too much space in your luggage? 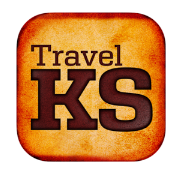 Do you want Kansas travel information on the go? Then the TravelKS app is for you! Discover local restaurants, roadside attractions, and places to stay along the way. Connected to TravelKS.com, our travel app is designed to update nightly so that you have the most recent attraction info possible. Car crazy? Art lover? Historically driven?